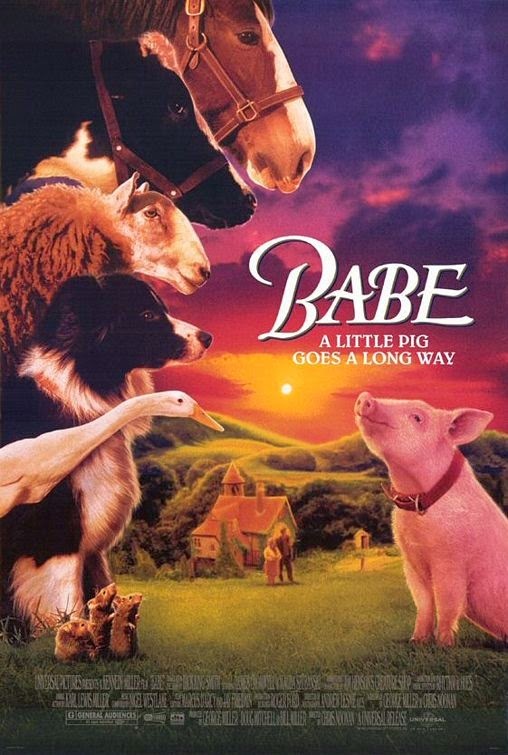 Babe (voiced by Christine Cavanaugh) is a pig who, as the runt, was separated from his mother and sold off to a man named Arthur Hoggett (James Cromwell), a man of few words. On Hoggett farm, Babe was raised by Sheepdogs. His adopted mother Fly (voiced by Miriam Margolyes) treated him well and raised him like her own, though Rex (voiced by Hugo Weaving), Fly’s partner, did not like the idea of a pig thinking he’s a dog, since pigs are lower animals than dogs. Despite all of this, Babe grows up a happy pig on the farm until the day he finds out what pigs are raised for. In order to save his life, Babe must show Farmer Hoggett that he is too special to simply become ham with a side of bacon. Babe wants to show that he can be a working animal and heard sheep just like his adopted parents Fly and Rex. After Rex and Fly are taken out of commission, Babe gets a chance to prove his worth and save his hide and may even get a chance to compete in a sheep herding competition. Babe just hopes it’s all enough to prevent him from becoming Christmas dinner. Can you think of a cuter movie? Seriously, we can't. It is surprising to us that "Babe" got nominated for Best Picture, but it's just so damn adorable, is it really a surprise? Not only is it a sweet and excellent story, but the acting is fantastic, the special effects are stellar and the voice-over work by Christine Cavanaugh, Hugo Weaving and others is top notch. Babe himself is a brave but naive little pig, ready to brace the world snout-on as he tries to become a sheepdog. The story is perfect for kids, who will love watching Babe and his animal friends and all their (mis)adventures, and it is also wonderful for adults to enjoy alone, as well as with their kids. Technically, this movie was groundbreaking for its time, boasting a phenomenal mix of live action, CGI and animatronics. The way the filmmakers were able to capture the spirit and inspiration of this story is just astounding. It can be a bit dark from time to time, though, especially for much younger children, as this movie does deal with the subject of killing animals for food and some scary rivalries between other animals. James Cromwell is outstanding as the stoic, man of few words Farmer Arthur Hoggett, who comes around to the idea of having a pig for a sheepdog. Magda Szubanski plays Esme Hoggett, the zany and loud wife of Arthur, who is more than meets the eye. Though they are not huge stars, they help carry this movie as its leads, well, next to Babe, of course. Arthur's song "If I Had Words," where he dances around the living room after nursing an injured Babe ever so tender is one of my favorite songs and is one of the best parts of the movie. You can feel the love between Arthur and his little pig. Another cool part of this movie is the in-between title changes featuring the mice, which are adorable and a welcomed treat between each scene. Overall, "Babe" is a charming film definitely deserves a spot on your DVD shelf and is one that now, 20 years later, we still love to sit down and watch,even as adults. People of all ages can enjoy and be inspired by this film, but only this one, not its sequel. It's clever and delightful, sweet and sentimental, yet funny and informative. It will make you believe in yourself and that you too can do anything, even be a sheepdog.